A group of striking mineworkers finds support where they least expect it in the first trailer for Pride, based on an incredible true story. 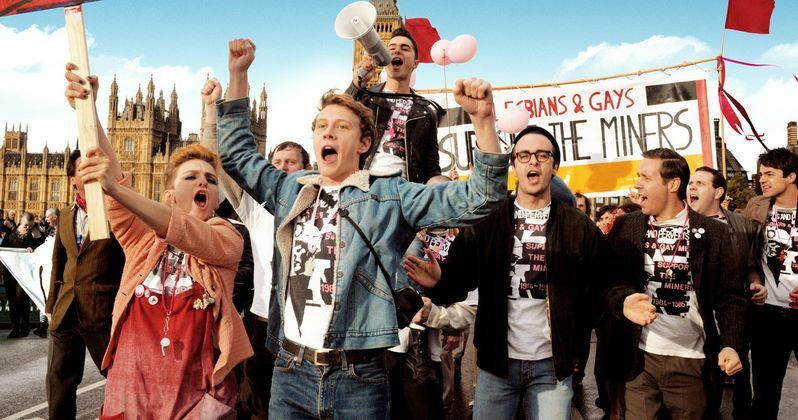 The plot is set in 1984, where the National Union of Mineworkers' strike caused a group of London gay and lesbian activists to help a small mining community in Wales. While the union and the community at large initially denies their assistance, they become unexpected allies with more in common than they once thought. We also have new photos from director Matthew Warchus' upcoming drama, co-starring Bill Nighy, Imelda Staunton and Paddy Considine, which hits theaters nationwide September 19. Pride is inspired by an extraordinary true story. It's the summer of 1984, Margaret Thatcher is in power and the National Union of Mineworkers is on strike, prompting a London-based group of gay and lesbian activists to raise money to support the strikers' families. Initially rebuffed by the Union, the group identifies a tiny mining village in Wales and sets off to make their donation in person. As the strike drags on, the two groups discover that standing together makes for the strongest union of all.